These days there are many kinds of IELTS help available – courses, books, private tutors, etc. The one thing they all have in common is that they cost a lot of money. IELTS preparation can be expensive – but it doesn’t have to be. The good news is that you can prepare yourself for IELTS and it will cost you almost nothing. All you need is one good IELTS study book and a lot of practice. You see, IELTS is the type of exam where good English doesn’t mean success; even native speakers can fail. Preparing for IELTS doesn’t mean learning English – it mostly means learning all the tricks and traps that IELTS is famous for. Be ready, aware and watching for them, IELTS is one wicked test. 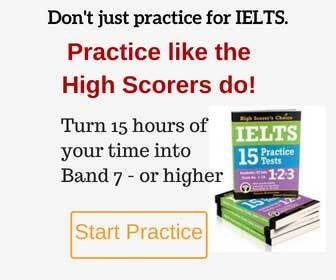 Anyone who wants to get a high band score in IELTS must expect several weeks of daily training. I came across certain books that promise to get you ready in 5 hours. Well, wake up! Have you ever done something meaningful in your life in just 5 hours? Maybe if you’re genius it would work, but regular people like me and you have to study for a month (and then, of course, we ace the test!). Now after I’ve told you what doesn’t work, let me tell you what does. First, read the IELTS-blog tips and get to know what to expect during the IELTS exam. Second, use the free online IELTS-like tests to practice on – all the links in the right sidebar. This really is a goldmine, because free IELTS tests are hard to find, usually they cost money. But don’t let that stop you, if you need to practice more – go ahead and buy more IELTS practice tests, it is money well spent. Another suggestion is to make a regular IELTS study plan and follow it religiously. Work every day for at least 3 hours, but don’t forget to take a day off once a week. Click here for more IELTS preparation tips.